A model of the new operations campus in Monrovia. Image: Gold Line Foothill Extension Construction Authority. Below is the news release issued Friday by the Foothill Extension Construction Authority, the independent agency building the 11.5-mile extension of the Gold Line from eastern Pasadena to the Azusa/Glendora border. Click here to receive construction updates on the project. As area residents can see, there’s a lot of work currently happening along the entire alignment. 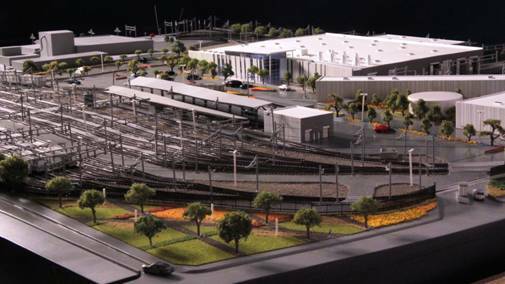 MONROVIA, Calif. – Today, the Metro Gold Line Foothill Extension Construction Authority (Construction Authority) announced a milestone in the completion of the 24-acre, $265 million Gold Line Operations Campus. Crews have now completed all design work, nearly 30 percent of construction, and nearly all underground utility installation. The Operations Campus is being built as part of the Metro Gold Line Foothill Extension light rail project from Pasadena to Azusa, and broke ground in September 2012. To date, all former buildings and a former frontage road on the southern boundary of the property have been demolished, the grade of the property has been significantly altered, and an extensive system of underground utilities has been installed. The campus is designed to be a state of the art, full-service maintenance and operations facility for servicing Metro’s expanding light rail system. It will house up to 84 light rail vehicles (enough to service the Foothill Extension and other regional lines), and contain areas for vehicle inspection, heavy repair, body repairs, painting, storage, cleaning and more. In addition, nearly 200 Metro employees are expected to work at the facility, involved in both the maintenance and operations of the county’s light rail system. The facility is on schedule to be ready to receive light rail vehicles starting in early 2015, in advance of the Foothill Extension from Pasadena to Azusa light rail project’s full completion in September of that year. The Construction Authority is an independent transportation planning and construction agency created in 1999 by the California State Legislature. Its purpose is to extend the Metro Gold Line light rail line from Union Station to Montclair, along the foothills of the San Gabriel and Pomona Valleys. The Construction Authority built the initial segment from Union Station to Pasadena and is underway on the Gold Line Foothill Extension. Explain how these Construction Authorities came to be and what their future is. For example, apart from Expo and Foothill, will Metro be required to use them for the other projects like the Purple Line or Crenshaw? A summary of how the Construction Authorities are governed and staffed versus how such a project is/was handled in-house at Metro or its predecessors would be, I think, interesting to your readers, many of whom may not know all the background. Thanks for the idea. I’ll put it on the list. As far as I know, none of the Measure R transit projects outside of Expo II and Foothill will be built by construction authorities, but obviously this is a long-term building program and things can certainly change. It’s not a destination, it’s being built so that people living in Azusa and Duarte can use the Gold Line to get to other parts of LA rather than jamming up the freeways. Metro hopes that by extending the Gold Line out there, it’ll be able to provide a cheap, taxpayer subsidized alternative for residents living in Azusa and Duarte to travel 40 miles to Santa Monica or Long Beach for only $1.50. Whether that makes any sense or not is bound for heated discussion. Asdf: I think you’re thinking backwards. Gold line foothill extension is being seen as a feeder into downtown jobs. Takes people to work. People who live in Azusa or Duarte or Arcadia take the gold line into union station, take redline or expo or busses to get to downtown jobs. Although Azusa and Duarte may not be “go to destinations”, the extension will offer better access to the Gold Line, for people traveling to Pasadena, Los Angeles and points beyond. Right, but I didn’t think the demand for car reliant suburbs outweighed the need for transit improvements in the urban core. Still a step in the right direction I guess. Arcadia is a destination for Santa Anita, the mall, and the Arboretum. Old Town Monrovia is a fine destination. City of Hope is a destination. I hope that there will be a shuttle between the Irwindale or Duarte station and the speedway. Once the line goes to Pomona, the Fairgrounds will be a destination. These temporary “Construction Authorities” started with the Blue Line Construction Authority for the LAUPT to Pasadena route since re-named Gold line. It was a dark time at the SCRTD/LACMTA as the subway construction fiasco culminated in the collapse of Hollywood Blvd. greatly eroded public confidence in any further rail construction that also included scandals regarding earlier improper construction by contractors including damaged membranes meant to keep methane out of tunnels improperly installed resulting in damage and breakage of the membranes. Further, revaluations that the tunnels themselves were not contructed to specifications caused concern that they would not last the 100 year proposed design, or,, worse fail in an earthquake. Independant engineers assessed the tunnels and while it was confirmed they were not constructed to spec, they posed no danger to the public and found no concern for performance in a seismic event, the life of the tunnels would be closer to 75 years. Also, at the recommendation of the engineering panel, steel “struts” were installed at key points in the tunnels (most noticeable at the ends of each phase ONE station where the station box ends and the tunnels begin. All this just meant the public and politician no longer had faith in SCRTD/LACMTA to oversee construction of any rail projects. In addition, scandal at the the LACTC involving improprieties at it’s Rail Construction Corporation (RCC) were made public and the result was a lack of faith at the LACTC, as well. After the LACTC & SCRTD merge to create LACMTA, the economic downturn of the 1990’s hit hard and ended any hopes of the ambitious rail plans for LA County. LACMTA killed all rail plans except for Red line extensions. The death of the Blue line extension to Pasadena was a big blow to SGV politicians and interests. But, those folks refused to let the the promised Pasadena line die. So the SGV interests first had to deal with the fact that LACMTA was just to scandal ridden to build the line, at least in name. So, state legislation was passed creating the Blue Line Construction Authority, an entity separate from the bad press LACMTA, at least in name. This was a clever political move that avoided the Times writing more negative OpEds about the LACMTA and rail construction. The BLCA was in charge of planning and constructing the line, but would cease existence, according to the legislation, upon completion of construction and hand the line over to the LACMTA for operation and ownership. Yes, the BLCA immediately cheapskated the project by killing any chance of proposed box tunnels for Highland Park (currently the slow street car running section), further cut costs for the line by deciding NOT to battle business owners who opposed the original Green Street alignment and transit mall concept that would have taken buses OFF of busy Colorado Blvd. in Pasadena and the rail line directly serving PCC, saving time and money, but it actually WORKED! Virtually ZERO bad press and the line, however diminished, was built and with us today, with it warts. This was so successful, all future rail projects would use this model. However, some would say it is just a public relations move as LACMTA was and acts as a contractor to any of the Rail Construction Authorities and quite a few LACMTA staff may be “re-assigned” to a Rail Construction Authority, but as a RCA staff member, not LACMTA staff member. Regardless, while it may be virtually no different than if construction were handled “officially in-house,” it does keep the LACMTA official entity protected form controversy during construction, in the minds of the public, that the soon to die RCA has any problems or bad press die with it, leaving the LACMTA, in the minds of the public, free from the ghosts of the past and the public focused on operations. I, too, would love Steve’s take and research on the who RCA concept now used, and even the bad blood and history that forced the merger of mortal enemies SCRTD & LACTC. Hint: Blue line and Red line would NOT connect as they do today as the two agencies could NOT cooperate, and the was the final straw that saw former Assemblyman Richard Katz author and eventually pass legislation merging the two agencies as one.